I understand that there are special challenges that face any couple with special needs, whether one or both of you is disabled, because I lived as the disabled partner in such a relationship myself. Yet I congratulate you warmly on your decision to get married, to partake of the happiness a deeply committed relationship brings! My wish for you both is joy, and that you may help one another. Seventeen years ago, when I became a young stroke survivor, I became a member of the "differently-abled" community. I was married, and raising a young daughter. 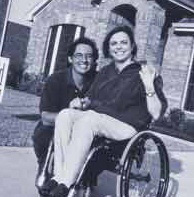 My experience of living as a newly-disabled partner in my own marriage relationship was the beginning of my education! Now, still a member of that "differently-abled" community, I am an ordained wedding minister. Are you looking for someone who can understand some of your unique problems as a couple? Someone who can rejoice with you as you plan this momentous step? Someone to whom you're only "special" in the best sense of the word? I invite you to take a look around my site; especially at "My Story" (link at the end of Rev. Susan biography), a very personal expression of the way I experience my life and my calling. I am gentle, caring, and incurably optimistic. Whatever your situation, we can find a way to meet, and talk, with no obligation on your part.